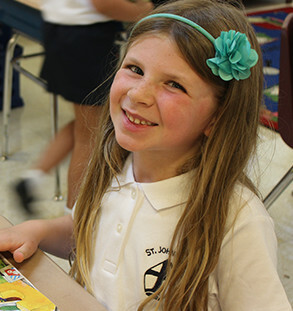 Saint John Paul II Catholic School firmly believes in encouraging students to participate in activities beyond the normal school day. Doing so allows children to interact with their peers and adults outside of their regular classroom environment, pursue individual interests, and develop new skills. We offer a wide range of activities for all ages, and these programs are consistently popular among the students. The SJPII Catholic School Drama Club hits the ground running every school year in preparation for a full-length spring musical. A summer seminar introduces students to the production’s characters, storyline, music, and choreography. The drama club will hold auditions during the first few weeks of school, and cast rehearsals begin shortly thereafter. Student volunteers join the stage crew later in the fall, and every Wednesday afternoon becomes devoted to show preparation. There is not likely a busier club on our campus! Please contact Ms. Haley to learn more about our drama club. After school, we offer a weekly running club for younger students and athletics activities throughout the year to help our students stay in tip-top shape. One of our most exciting events is an annual 5K race every February, known affectionately as “Mardi Gras Miles.” Please email Stephanie Kane, our PE teacher and athletics director, with any questions you may have about our fitness program. The newspaper is a great way for students to share their writing and creative talents with the school community. Students in grades 5 through 8 produce a monthly newspaper for distribution. We hold meetings after school or during study hall and lunch recess times. Student staff writers independently write stories and submit them to the student editors to check and make recommendations for revisions. Students take pictures, conduct interviews, and design and lay out the pages. Science Olympiad is a premiere, national science competition. Students participate in hands-on activities and prepare as a team to compete in a local tournament. The Olympiad exposes students to a variety of disciplines including genetics, earth science, chemistry, anatomy, physics, mechanical engineering, and technology. Students in grades 4-8 meet weekly on Tuesdays after school. Students research a real-world problem such as food safety, recycling, energy, etc. We challenge them to develop a solution and to create a presentation to share their research/solution. Students also design, build, program a robot using LEGO MINDSTORMS®, and compete on a tabletop playing field comprised of a variety of challenge missions. Learn more about our national programs by visiting their websites.